Baguio Flower Festival also known as Panagbenga Festival is one of the famous and world renowned festival in the Philippines. 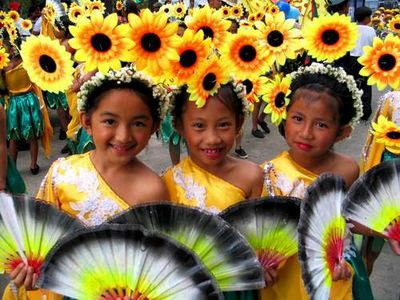 Baguio is also known as "Flower Garden City of the North" celebrates the festival in February and the highlights of the festivities includes flower, flower exhibits, lectures, garden tours, floral contest and a parade of floats. In this festival, flowers rule! Held in February, it highlights Baguio as "The City of Flowers". Started in 1995,it reflects the history, traditions and values of Baguio and the Cordilleras. A festival hymn was composed by Prof. Macario Fronda, band master of the St. Louis University. To this music was added the rhythm and movements of the Bendian dance, an Ibaloi dance of celebration. The Bendian dance's circular movements speak of unity and harmony among the members of the tribe-themes foreshadowed the coming together of the various sectors of the community to bring the festival to life. Panagbenga represents the many facets of the "Summer Capital", its people and its heritage. Like the festival, the city blooms with brimming talent, natural beauty and indominable spirit. With the sights, sounds, smells and tastes of Baguio, every trip to the City of Pines becomes a memorable experience that will keep you coming back for more.